This one goes out to Scott + Eric. 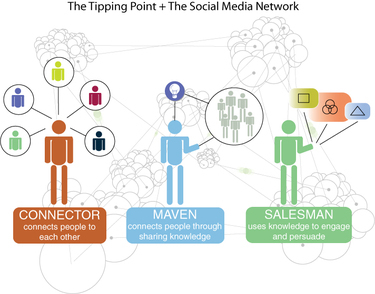 The Connectors, Mavens, and Salesmen help fuel the growth of the Social Media Network (shown behind). Each type of individual possesses a complimentary quality that when combined, creates an infectious momentum which spreads rapidly. * Connectors: Those with wide social circles. They are the "hubs" of the human social network and responsible for the small world phenomenon. * Mavens are knowledgeable people. While most consumers wouldn't know if a product were priced above the market rate by, say, 10 percent, mavens would. Bloggers who detect false claims in the media could also be considered mavens. * Salesmen are charismatic people with powerful negotiation skills. They exert "soft" influence rather than forceful power. Their source of influence may be the tendency of others, subconsciously, to imitate them rather than techniques of conscious persuasion.